This title is directed primarily towards health care professionals outside of the United States. It presents the application of the model of cognitive behavioural intervention in the practice of physiotherapy and occupational therapy addressing a range of clinical problems with contributions from professionals who are specialists in their field. 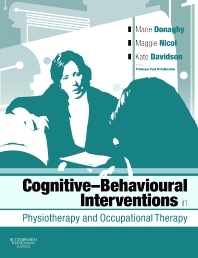 The book explains the psychological model and provides a rationale for applying CBT as a tool to strengthen physiotherapy and occupational therapy interventions. Case studies are integral to this book, highlighting the application of CBT, outlining the strategies, and illustrating the outcomes and boundaries of treatment. Everett T., Donaghy M.E., Feaver, S 2003 Interventions in Mental Health: An evidence-based approach for Physiotherapists and Occupational Therapists Oxford: Butterworth Heinemann.